The first day of the inaugural Microsoft Data Insights Summit has come to a close! If you missed today's presentations you can catch the highlights below, and tune in tomorrow to the livestream starting at 8:00 a.m. PT. The day kicked off at 8 a.m. Pacific Time with the keynote presentation delivered by Microsoft Corporate Vice President James Phillips and Technical Fellow Amir Netz. Phillips started by pointing out that in less than a year Power BI has grown from supporting 45,000 businesses to over 200,000, and the platform just recently reached 5 million users, all of whom now have access to the widest connectivity of any Business Intelligence vendor. The SandDance visual is available now on the Power BI Visuals Gallery. At 11:00 a.m., Microsoft Senior Program Manager Miguel Llopis took the stage to talk about Shaping External Data with Unprecedented Ease and Power in Excel. Llopis explained that data is not easy – it’s hard to find the right information, it needs to be reshaped often, and combining multiple sources can be difficult – but getting your data models right in Excel makes everything a lot more manageable. At 1:00 p.m., Ted Way, Program Manager for Azure Machine Learning, lead a presentation on Machine Learning with Excel and Power BI. 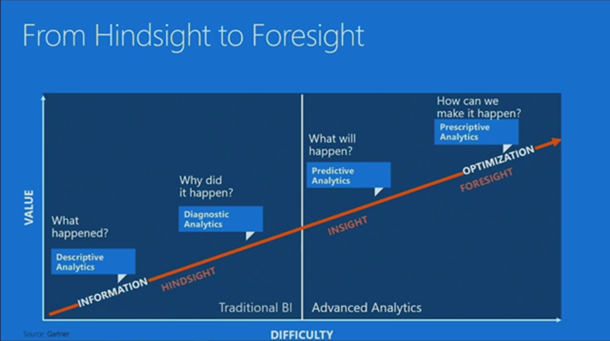 Way explained for those new to machine learning that it’s a path to move from hindsight to foresight, turning traditional BI into predictive optimization that can create desired actions. He displayed some of the ways that Azure Machine Learning can work with Excel and Power BI by doing a live demonstration of sentiment analysis on today’s tweets about the Microsoft Data Insights Summit, and forecasting the survival rate of hypothetical passengers on the Titanic. The Machine Learning Studio is available to everyone for free at Azureml.net. At 2:00 p.m., General Program Manager Lorrissa Horton and Program Manager Julie Zhu joined the livestream to deliver a presentation on Monitoring Your Business Using Power BI. 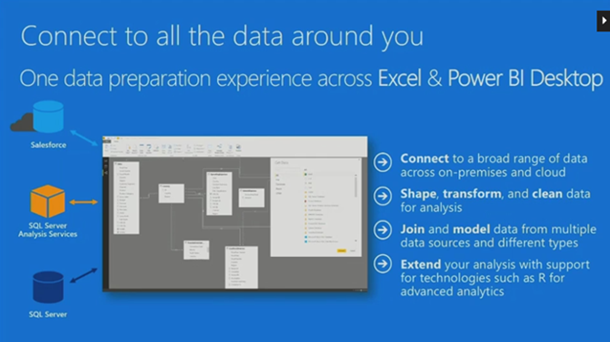 Horton pointed out that the goals of Power BI are to provide a set of experiences that are available where ever your customers are, with a multitude of end-points and collaboration tools to help. Horton and Zhu gave a full tour of the content lifecycle, including organizational content packs, dashboards, and various distribution methods. They ended the presentation with a glimpse of what Power BI business users could expect in the future, such as an improved staging environment, read-only content packs, and the ability to share dashboards and reports with edit permissions. At 3:30 p.m. James Phillips rejoined the stage along with a highly esteemed panel of executives: Corporate Vice President and CIO of Microsoft Jim DuBois, Microsoft CFO Application and Services Group and Cloud and Enterprise Dave O'Hara, Strategy and Science Advisor for the Elizabeth Glaser Pediatric AIDS Foundation Dr. Nick Hellman, and the Director of Microsoft Technology and BI for Metro Bank Bruce Rioch. Each panelist discussed the impact that data and Power BI has had on their organization, and in every case the results have been transformational. 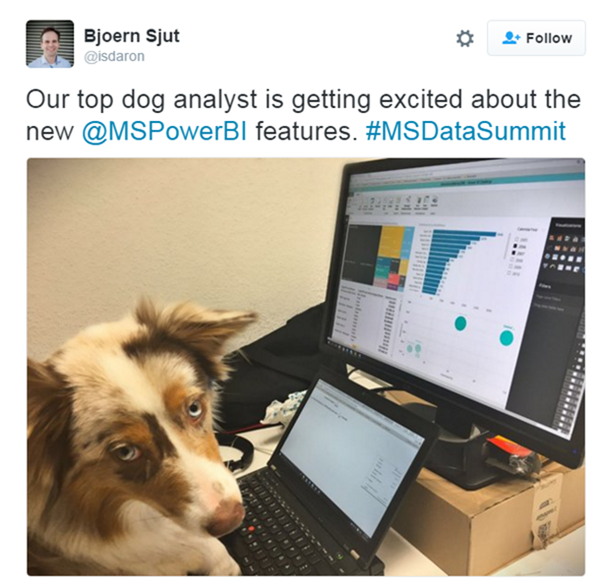 O'Hara reported that his finance employees use Power BI every day, saying, "It's not about reporting data, it's about driving outcomes." Hellman described the adoption of data driven decisions as moving from "trudging through the dark" to using Power BI as a "flashlight that lets us see where we're going". Rioch stated that the use of real-time data and analytics has allowed Metro Bank to make quick decisions and save a countless amount of money, while DuBois explained that decisions that once took months and an army of analysts can now be made in days or even minutes. Today’s Microsoft Data Insights Summit was packed full of amazing announcements and industry knowledge – and there’s still another day to go! The livestream starts up again tomorrow morning at 8 a.m. Pacific Time, and includes featured speaker Nate Silver at 3:00 p.m. Join us!